Edmond Dantes is betrayed by a coworker who wants his job, a romantic rival who will steal his bride, and a crooked government prosecutor with a dark secret to hide. Thrown into prison for decades, Dantes eventually escapes, becomes fabulously wealthy, and vows revenge on those who ruined his life. 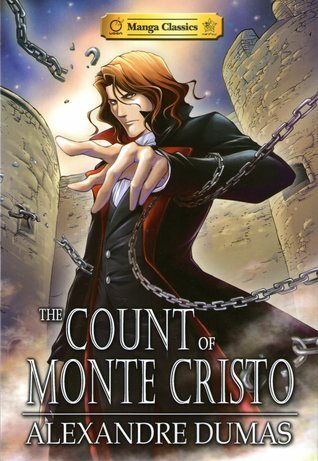 Count of Monte Cristo is one of my top five favorite novels of all time, so I was interested to see how one of my favorite stories would translate into manga form. Although they had to simplify the story considerably, and there are really too many characters for a stand-alone manga, I enjoyed this wonderful adaptation of a classic tale! I love the beautiful artwork! I was glad to see that each character has such a unique style that makes them, their clothing, their hair, and face really memorable, which is essential with so many characters. There is also a family tree/character relationship chart at the back of the book to help you keep track of all the characters; although it does contain some spoilers, so I wouldn’t look at it if you haven’t previously read the story. Even though the story is condensed, the bones of the novel are there with all their intricacies and mystery and flair. I was especially glad to see that character development is not lost in the super-plot. The author takes time to establish emotional connections between characters, and we still get to see Dantes go through all the ups and downs of his passionate nature. So much of the beauty of the story is lost because of the constraints of the manga form, but I think the author did a superb job of maintaining the truth of the story, the style and expression of the book.